Village Voice cartoonist Lauren Weinstein joins the show to talk about the balancing act of making comics. We get into how she integrates the political and the personal, finds humor alongside near-tragedy, and deals with the temptation to do self-help/identity comics. We also get into how she manages the tightrope walk of motherhood and comics-making (esp. with a 10-month-old who’s constantly grabbing for her ink), the conversation around a comic she did about potentially passing along a hereditary disease to her unborn daughter, the moral tensions of teaching comics, drawing strips for digital vs. print, the transformative effect of reading Dan Clowes’ Art School Confidential strip, having an on-stage persona for a mutant band where the mantra was “keep your eye off the ball”, needing neck surgery but worrying how paralysis would affect her cartooning, and more! Give it a listen! And go buy her latest Normel Person mini-comic! 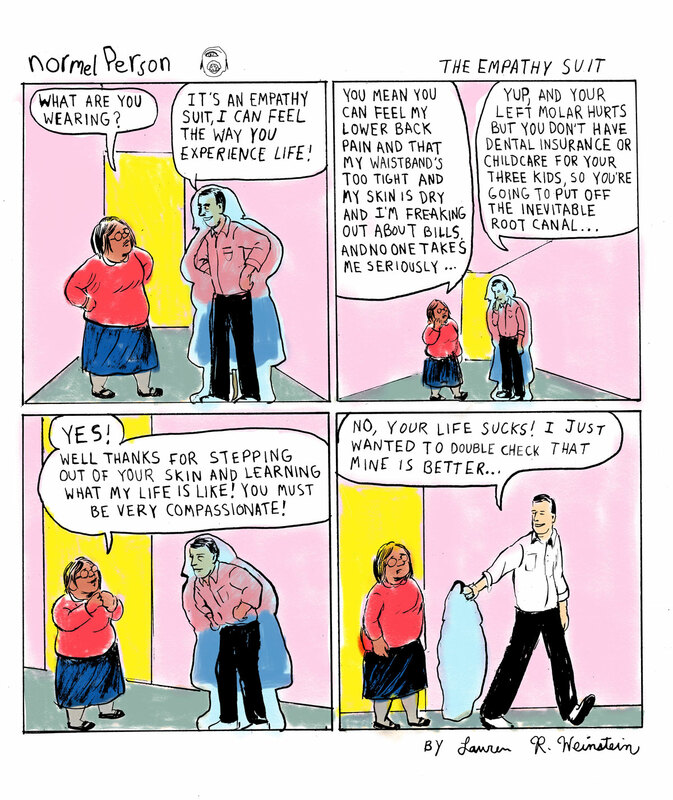 Lauren Weinstein’s highly acclaimed comic strip, Normel Person, can be found weekly in the Village Voice. Sometimes her work can be spotted in the New Yorker and The Guardian and The Paris Review. She has published three books: Girl Stories , Inside Vineyland and Goddess of War . Currently she is working on a teenage memoir tentatively entitled Calamity, to be published by Henry Holt, and a comic about motherhood for the publisher Youth in Decline. Credits: This episode’s music is Nothing’s Gonna Bring Me Down by David Baerwald, used with permission from the artist. The conversation was recorded at stately Virtual Memories Manor on a pair of Blue enCORE 200 Microphones feeding into a Zoom H5 digital recorder. I recorded the intro and outro on a Heil PR-40 Dynamic Studio Recording Microphone feeding into a Cloudlifter CL-1 and a Mackie Onyx Blackjack 2×2 USB Recording Interface . All processing and editing done in Adobe Audition CC . Photo of Ms. Weinstein by me. It’s on my instagram.